The Jerrahi (Turkish: Cerrahiyye, Cerrahilik) are a Sufi tariqah (order) derived from the Halveti order. 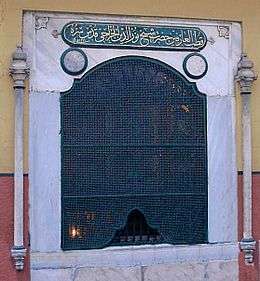 Their founder is Hazreti Pîr Muhammad Nureddin al-Jerrahi (1678-1720), who lived in Istanbul and is buried at the site of his tekke in Karagumruk, Istanbul. During the late Ottoman period, this Order was widespread throughout the Balkans, particularly Macedonia and southern Greece (Morea). The Halveti-Jerrahi Order of Dervishes is a cultural, educational, and social relief organization with members from diverse professional, ethnic and national backgrounds. The head dergah "convention" of the Halveti-Jerrahi Order is in Karagumruk, Istanbul. There are some substations in Turkey and it has branches in some European countries, Australia, South Africa, South America and North America, including Los Angeles, New York, Mexico, San Francisco, Toronto and Chicago. 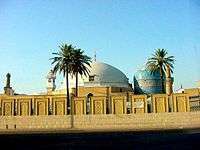 Branches of the Halveti-Jerrahi Order conduct gatherings where the dervishes perform Sufi remembrance ceremonies (dhikr), practice sufi music, serve dinner, pray together and listen to the discourses (sohbets) of their Sufi guides. This Sufi Order was brought to Western countries by Muzaffer Ozak (1916-1985), who was the 19th Grand Sheikh of the Order. Muzaffer Ozak was Grand Sheikh from 1966-1985. Sefer Dal Efendi (1926-1999) was Grand Sheikh of the Order from 1985-1999. Omer Tugrul Inancer Efendi (born 1946) has been Grand Sheikh of the Order since 1999.